There are currently 8,772 users on this website. Back out the fields again digging the deep ones with all frost but gone. Hit an area I haven't be to in about a decade, tried a couple of fields that gave up some finds in the past and got a few more coins today. 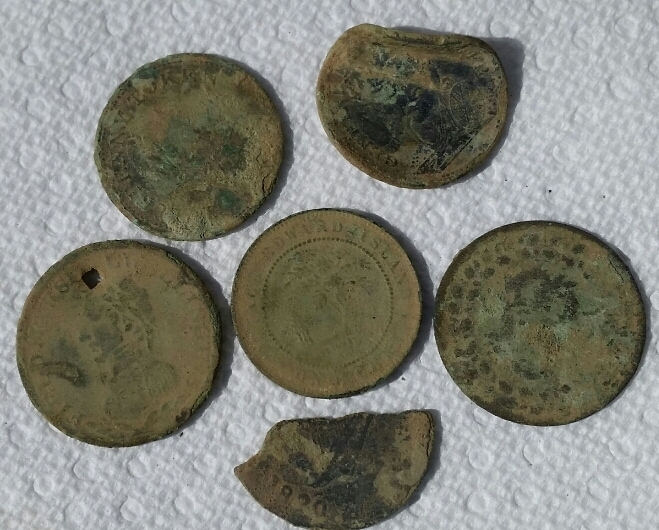 A pair of NS halfpenny tokens( Genuine British Copper) a holed Wellington half penny token, a very crusty imitation Tiffin halfpenny token 1812, a broken Bust and Harp 1820, and finally a PEI cent of 1871. Going get out again soon so stay tuned for some more finds! It looks like you have a really nice detecting site. Good luck on more nice finds. to Earle. ..gold would be great! I've been at this for well over twenty years and I've not been lucky enough to find any gold coins under my coil , but that's the thing about detecting...you just never know!